I'm the only one, but I don't think the NSX is that great. It just doesn't seem that special to me. Never wanted one. I prefer the S2000 over the NSX. I would much rather have a F355, over the NSX. Much more exotic. 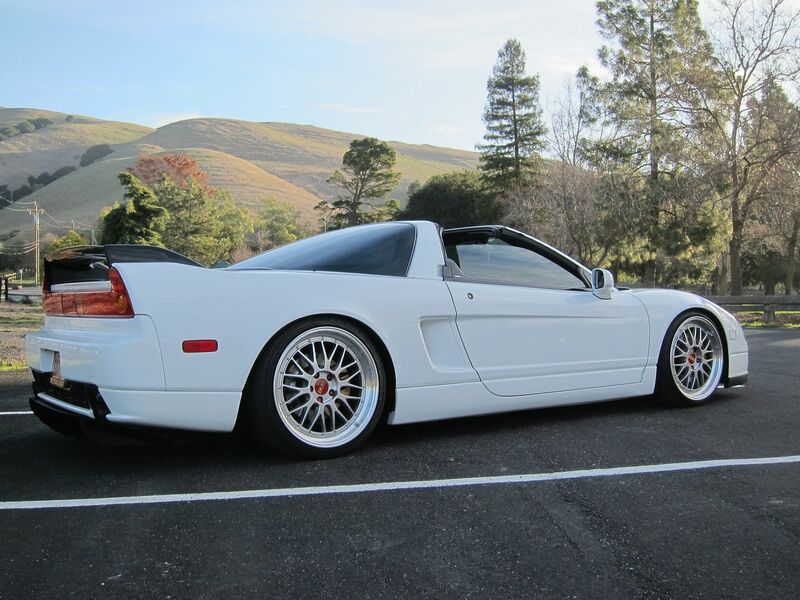 I would much rather have the F355 too but i would much rather own the NSX. I enjoy watching Best Motoring's NSX-R footage, like when the car keeps up or passes exotics with twice the power. It's like when you pass V8s or other expensive cars at the track in the S2000. Makes you giggle a little bit. Let's not forget it was designed and built with the Japanese horsepower limit of 276. I think it is an amazing machine given the limit in power. A lot of those races are so rigged it isn't funny. And it definitely outputs over 276hp. The R32 GTR was meant to have 276hp and was giving readings of 330 completely stock. I'm not a big NSX fan by any means, but it looks better than a 355 to me and I'd rather live with the NSX day-to-day as well. I remember playing Gran Turismo (1) in 97 and seeing the NSX. This was when I knew basically nothing about cars, and I knew it was something special immediately. I thought of it as a supercar right up there with the Ferraris and Porsches even though I had hardly even heard of Acura and definitely not that particular car. I preferred driving it in the game over just about everything else I tried as well. The question is have you driven the real car not the video game version? After all those glowing reviews and then looking at the specs of only at small V6 you would think with all the high horsepower cars we have now that the car is seriously outdated but when you actual drive the car all those things fall to the wayside and you get the "WOW" factor that is missing in a lot of so called newer , better, faster cars of today . The NSX has a "Feel" to the road like the S has but it is so much different as in the NSX is more comfortable,less tail happy handling, more 911 like in the way the car sounds when you romp on it. It seems to be a little secret that slipped by everyone that this car is the poor man's bargain Ferrari. Of course the Ferrari big speed is not there but neither is the Ferrari Big price tag. You're asking him if he's drive one, but have YOU? Driving and owning one was definitely nothing close to the paragraph you poorly wrote above. Wow factor? Elaborate please. Drove a red 92 with about 60,000 miles and was not in great shape but wanted to know what it was like to drive . First thing you notice is how low the car is because you keep falling into the seat but once your there you look out and realize the visibility is superb and the side glass looks like gun slits because they are so narrow and you feel like you could be in a Ferrari especially with a hood that low . Next you notice that the controls are like a regular Honda with no suprises and you quickly become very comfortable with the car more so than most anything I have ever driven. It was like it was made for you. Then you see the speedometer and realize that is not a normal Honda speedo because it reads speeds a Civic could never dream of. Then you realize that sound behind is not normal Honda either but more like S2k meets 911. It seems to be as nimble as a Civic in city driving,comfortable as an Accord on the highway yet the supercar Senna machine lies in wait for you to dip into the go pedal. After being used to the S2k the NSX is not quite as nimble but makes up for it by being more user friendly. The "WOW" factor is in how this car just works in any given situation with no downsides other than the hp dept. An STI might be faster but it has a heavy clutch and rides like crap which detracts from the fun of it.Drove a C6 Vette and the steering and shifter seemed sloppy . No such faults in the NSX . Maybe a supercar should not be as docile as this one at slow speeds but I am sure the comfort is appreciated in those that daily drive this car. This car is like a 911 in the fact that if you drive one you understand what it is about and in a 1990 Car and Driver NSX test they said the only low was having to get out. I fully understand why they said that now . The only car I have driven that was better than the NSX was a 997 911 .
anyone know why honda didn't give it a better steering ratio? early years NSX had quicker steering rack. but also 5 gears transmission and 20bhp less powerfull engine. When I was looking to buy a Dc2 Integra, I noticed on the 94/95 steering wheel air bag it said Acura instead of the "A" logo. It was a turn off and looked real dated. Luckily when I bought my 1996 Teggy, it had the "A" logo on the steering wheel. I was so relieved. Now why wasn't this done on the flagship NSX?? And you seriously care about whether the steering wheel has "Acura" or just the logo "A" debossed? For the fawkin price they are asking, I'm severely worried about it. They should of updated the steering wheel cover and probably the steering wheel. They updated the 2004 TL steering wheel in 2007 and it had the "A" logo on it. Call it petty if u want, but we are talking a $90k car new. Sorry - from the outside, it still looks great. Saw a few on the road in San Diego and loved each of them. The original model with 15/16 wheels doesn't look so good (big wheel gap / tiny wheels/tires) but with larger wheels (even stock 17s from the later models) and the car slightly lowered, it looks really, really nice to me. We've had two in the family, by the way. I've been an NSX owner for quite a few years now and this topic is hotly debated on nsxprime quite often. The NSX is a special car and if you are about HP or pure straight line speed, this car is definitely the wrong car. In response to your steering feel, I tend to agree though. In the late models like my 2004, they changed the steering feel to more of a GT type car which I actually dislike. The older NSX's with no power steering were much more fun to drive. The s2000's crisp steering is hard to beat but they really are two different cars. I drive both on different occasions and have learned to appreciate both for what they are. Mine is pretty much stock exhaust for an exhaust and in most city driving, it's plenty of power. I can be doing 80+ pretty easily so I don't see or feel the need for more power (maybe I'm just getting old). Nowadays I drive the NSX/s2000 less and less because of family priorities so I wish these cars had back seats for my kids. As we age our priorities change but we learn to appreciate each for for it's good/bad. No car is perfect. One thing to keep in mind is few cars can make claim to holding it's resale value like the NSX. It's probably the best value short of vintage collector cars! Which car was a bigger achievement for Honda?